Book Drunk: Guest Review ~ The Year of Taking Chances by Lucy Diamond. 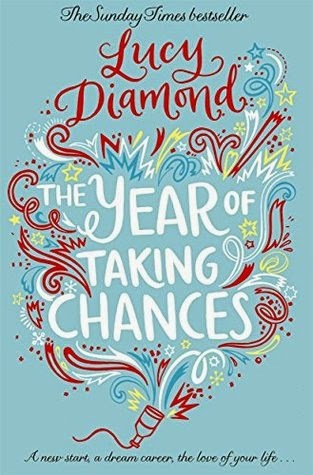 Guest Review ~ The Year of Taking Chances by Lucy Diamond. Title: The Year of Taking Chances. Ebook Publication Date: December 15, 2014. Paperback Publication Date: January 1, 2015. Firstly thank you Sophie for sending me this fantastic book I can see me recommending this to everyone this year and already see it as one of my top recommendations of 2015. The story has such a feel good factor to it even though serious issues are covered within it. The book starts off with three women, Gemma, Caitlin and Saffron, who do not know each other meeting at the New Year’s Eve party of Gemma and Spencer Bailey. The women bond over a cocktail and fortune cookies which none of the women really think are ones to live up to. They enjoy the good company of each other and have a laugh at their aspirations of forming a girl band! The women are all very different to each other but as the year unfolds they all seem to change in their outlook to life and what they want for the future. At the start of the book Gemma is married to Spencer and has two children. Spencer and Gemma are very happy together and are very deeply in love. Caitlin is only in the village for a short period to pack up her childhood home after the sudden death of her mum. Saffron is in the village to have a bit of thinking time and is staying in a small cottage next door to Gemma and Spencer. She is a successful PR executive working in London. How they change and how lives events affect them you will have to read to find out and what a great read you are in for. The book will have you thinking about serious issues that could arise and how you would react but it has such a lovely caring nature to it that you will want the best for all the characters involved.